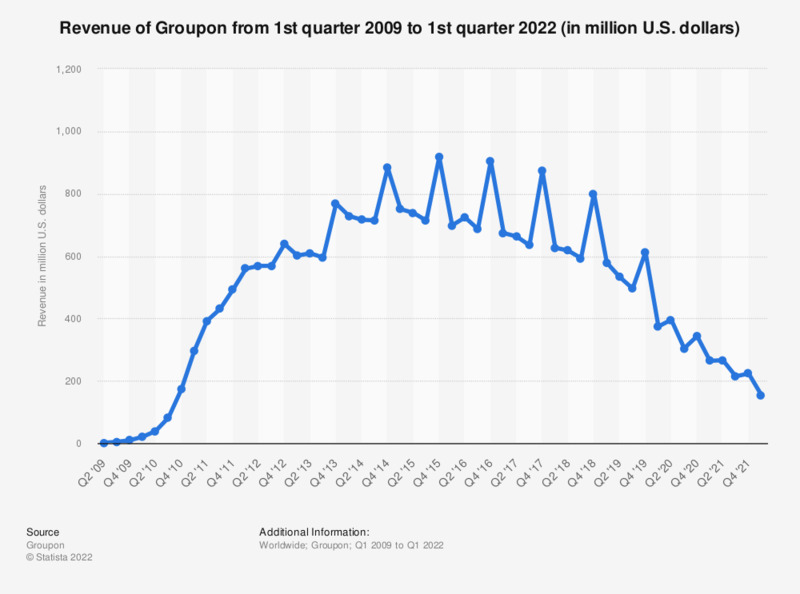 The statistic above shows Groupon's revenue from the first quarter of 2009 to the fourth quarter of 2018. During the most recent reported quarter, the daily deal and local offer platform generated global revenues of almost 800 million U.S. dollars. A considerable amount of Groupon's revenue is generated through its mobile platform, where the number of mobile Groupon app downloads worldwide reached 190 million downloads in September 2018. *As of March 31, 2017, Groupon has completed the dispositions of operations in 11 countries. Accordingly, the results of operations in those 11 countries are presented as discontinued operations, appearing net of tax in a single line in the company's consolidated statements of operations. Prior period results have been updated to reflect that discontinued operations presentation. Values regarding Q1 2016 been adjusted accordingly. As of Q3 '15, Q3 '14 has been retroactively adjusted due to foreign currency losses.